SFTT has yet to learn when these programs will begin or how many Veterans will be enrolled in these initial programs. As important, SFTT and the HBOT community at-large is interested in learning how “test protocols,” “metrics,” and “clinical trials” will be set by the VA and DoD to determine the benefits of HBOT. As one sorts through the often nasty exchanges between proponents of HBOT and the VA gatekeepers like Dr. David Cifu, one cannot be oblivious to the fact that the VA does not want to encourage the adoption of HBOT in treating Veterans with PTSD and TBI. The VA’s claim is that “patient outcomes’ using HBOT are inconclusive based on VA and DoD trials. Could it be – as many have suggested – that the test protocols were flawed to produce “inconclusive” test results? From SFTT’s experience in monitoring the DoD, it would NOT BE THE FIRST TIME that test procedures have been deliberately modified to produce outcomes more to the liking of current military dogma. Since the VA has no experience in using HBOTin treating Veterans with PTSD, it seems to make sense to use established experts in the industry like Dr. Paul Harch, members of the International Hyperbarics Association or The Sagol Center for Hyperbaric Medicine and Research in Israel which provides HBOT treatment to 120 patients a day and to the Israeli Defense Force (“IDF”) to agree on standardized test protocols and monitor results. While Secretary Shulkin is wise to proceed slowly, he must exercise extreme caution in allowing the naysayers within the VA any authority over the initial CCI HBOT trial programs. Assuming the VA leadership can get beyond the hurdles they largely created, Veterans with “mild TBI” and “persistent” PTSD should be able to quickly access hundreds of HBOT facilities across the United States. With equipment already in place around the country in hospitals and private health clinics, there is no need to hold up treatment for Veterans to wait for the VA to outfit its facilities. Follow this link to see a directory of currently active HBOT treatment centers around the country. Clear treatment protocols and directives need to be established for each private clinic providing HBOT to Veterans. HBOT is administered in a series of dives or sessions (usually between 28 and 40) over a 6 week to 2 month time frame. Supervision by a trained clinician is required at each dive. Clearly, a larger “dive chamber” capable of offering therapy to a number of Veterans at the same will help bring down the costs of HBOT. Costs “per dive” or “session” vary significantly around the country. Some hospitals charge $1,800 per session, but most private clinics offer this service at a cost of between $250 and $350 per dive. Given the bargaining power of the VA, it seems most likely that a series of battery of dives can be accomplished for well under $10,000, which is less than half of what the VA currently spends on Veterans with TBI/PTSD. 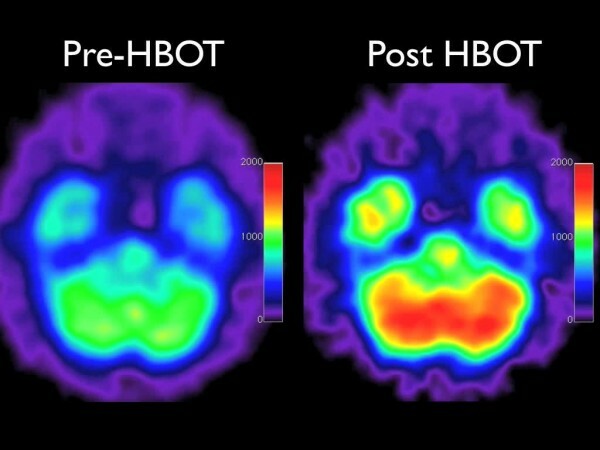 As SFTT has stated on many occasions, HBOT is not the “silver bullet” to eradicate this silent wound of war, but many more Veterans with brain trauma will begin to be able to reclaim their lives with less reliance on VA prescription drugs that simply mask symptoms rather than provide any lasting improvement in brain functionality. This could be a BIG DEAL for ailing Veterans and family members who provide our Veterans such caring support.